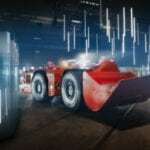 As part of its huge customer day in Finland,Sandvik has released a massive new underground development drill. In a similar vein to the revival of the Pantera line, Sandvik has revived its Axera family, dubbing the underground drill the Axera DD422i, stating that it is the next generation of drills. According to Sandvik these rigs have been developed specifically for 'intelligent development drilling' and have new drilling and boom control and features a 'next generation carrier". Speaking at the launch of the machine Sandvik's vice president for underground development drills, Ulla Korsman-Kopra, said the jumbo will be the most advanced underground rig on the market, and is part of a wider push by the company to help miners face the serious challenges plaguing the industry now, such as ongoing safety issues and the drive for cost efficiency, as well as the push into deeper mining. Korsman-Kopra told Australian Mining that "after spending years building up the platforms, the sub-systems, and making sure the technology works across its various other machines we were able to go from the design to the construction of the rig in a matter of six months". Coming in at a height of 3.15 metres high and 2.31 metres wide the machine weighs approximately 2.6 tonnes and has a drilling coverage, using a RD 525 rock drill, of 10 274mm by 6590mm. Sandvik stated that the DD422i's "high torque drilling control system is designed to minimise the jamming of rods and consumables," cutting the potential downtimes, adding that the "advanced boom control also provides better manoeuverability and precision in boom movements". Safety has also been a major factor in the design of the jumbo. It features a completely redesigned ROPS and FOPS cabin, which has an acid-proof option, a reduced level of noise, improved visibility, and fully adjustable controls. These controls are standardised throughout Sandvik's fleet, and allow for operators to easily switch between multiple machines. 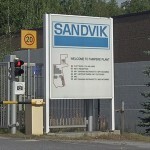 It also has what Sandvik calls a"human detection system", which is designed to ensure that miners working in the area of the rig are identified and eliminates the risk of people being caught within the operating area of the drill. The rigs automated systems play a large part in mitigating this risk. Korsman-Kopra told Mineweb that “by removing workers from mine danger zones through our industry-leading tele-remote equipment and automation options, we can help mine management deliver the safest-possible mining environments – even in the world’s deepest mines. Our Next Generation drill rigs will mean mines can offer their operators new roles as supervisors working in comfortable and safe conditions, rather than being directly involved in the mining process”. Further automation of the rig includes the Sandvik Intelligent Control System Architecture (SICA) as well as its drill and blasting planning optimisation tool iSure and full compatibility with its AutoMine Drilling systems. It has two versions of AutoMine Drilling, one designed for surface drilling, and a soon to be released version built for underground drilling operations. Korsman-Kopra explained to Australian Mining that this new drilling automation system will aid operators in achieving their optimum breakage as "we are looking at getting less wastage and dilution of product during breaking, as you don't want to inadvertently break too much rock because then you have excess rock to remove whereas you don't want to underbreak as you have to drill again". 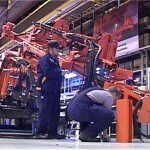 "Increased automation ensure a more predictable and consistent operation." It is driven by a Cummins 119kW engine in a tier 3 or 4 option and has a hydrostatic drive rather than a powertrain, which provides more control. The DD422i comes with a transformer which allows it to be used in multiple power zones around the world, allowing it to step up to 1000 volts for Australian operations or down to 400 for overseas operation, allowing the rig to be used across different regions by a single operator. The rig itself uses hard plastic instead of metal for its panels. Speaking to Australian Mining, Sandvike xplained that the plastic fibreglass panels are designed to let rocks bounce off them, as opposed to metal panels which tended to dent when hit with rock and in turn made movement of the then dented panels difficult. The panels are also coloured the entire way through the plastic so scratches will not change the colour of the vehicle or reveal a different colour underneath in way metal can. Maintenance is also easier, as the engine block is able to be swung out from the vehicle, and all components are easy to access, with the engine panels swinging out horizontally as opposed to gullwing style. According to the company the jumbo will most likely be used for incline development and is only for hard rock operations. The rig will be released next year,although it will first be tested further at Sandvik's Tampere underground testing mine after which Korsman-Kopra said it will be tested in Australia. Australian Mining attended the event courtesy of Sandvik.